Based on our list of all possible processes, can we document and improve all of them within an acceptable timeframe or must we choose a subset? For selected processes, will we prepare only overview maps (the “50,000 foot view”), or do we require maps with more detail, perhaps down to a level showing use cases or specific instructional steps? Will the level of detail be different for different processes? This may, in turn, help determine which knowledge capture we will use (described immediately below). At this point it is important to communicate the results of the classification, ranking and scope setting to all interested parties so everyone knows where the overall project is headed. 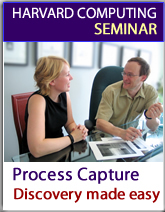 Course material from Process Capture course by Harvard Computing Group, Inc.